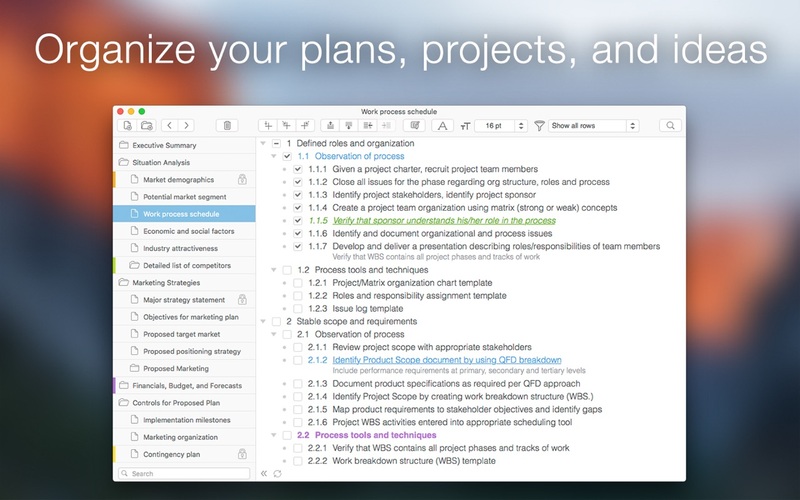 Cloud Outliner Pro 2 enables you to create and share outlines between your Mac, iOS devices, and Evernote account. Got a sudden flash of insight? Don’t risk forgetting it — just enter it right away on whatever device is closest, and see your changes synchronized with all your devices at once. This tool is not yet another notebook app or sticky notes organizer for mobile devices. Not even a little! Thanks to tight integration with Evernote and iCloud, extensive import and export functionality, rich-text editor, and a truly intuitive user interface, the solution will become your reliable assistant both at work and at home. You can seamlessly synchronize your records with Evernote and iCloud, share your data in different ways (PDF, OPML, HTML, plain text, emails, and even paper copies), and format your notes in the built-in powerful editor. All your thoughts, ideas, ongoing tasks, and even arbitrary memos will be kept safe and available close at hand. You can simply focus on the things that really matter — and the Cloud Outliner will cover everything else. Install Cloud Outliner to reduce complexity and easily align your daily routines! Next story Watercolor Studio Pro 1.4.0 – Automated photo to watercolor software. Previous story Wondershare Filmora 8.7.4 – Video and photo editing. OmniOutliner Pro 4.3.2 – Pro version of the popular outliner. OmniOutliner Pro 5.0.2 – Pro version of the popular outliner.